Clean Christian humor isn't hard to find - you just need to know where to look. He made YOU, didn't He? 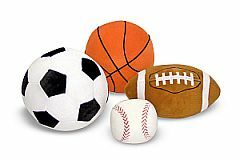 Following are some modern day sports found right in the Good Book - now what do you think of that? I know - some of you don't believe there were any sports in the Bible other than perhaps running, right? Would it surprise you to learn that there are inklings of modern day sporting lingo right there in the ancient book? Peter stood up before the eleven. Moses was first in the "rushes". Pharaoh made a pass at Abraham's wife. Moses went up on high. Moses served on Pharoah's court. Noah brought in the fouls (fowls) and the flies. Rachel walked off with the pitcher. And the prodigal son made a home run! !